The same owners as the Albion,a first class pub with ten handpumps for beer and five for cider,the brewery in the back yard has gone,they now brew in Esher. The service was of the cannot be asked variety but that is the only quibble. Made a return visit to the Antelope last night, after a maiden visit to the Black Horse in Norbiton (not listed on the site). 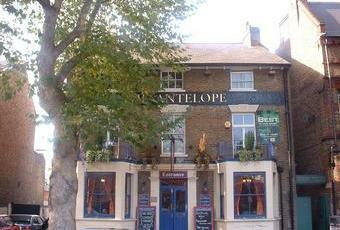 The Antelope is probably the best of this chain of pubs. Their loyalty cards are useful to have. But note that those issued by the Corner House in Windsor cannot be used in the other 4 pubs. Yesterday's ale selection was Big Smoke Solaris, Sunshower & Underworld, East London Brewery Foundation Bitter, Heavy Industry Pigeon Toed Orange Peel, Neptune Nammu, Summer Wine Firefly, Bristol Beer Factory Low Rider, Northern Whisper Soft Mick & Gun Milk Stout. Ciders were Charnwood Megablend Bone Dry, Bignose Beardy A Bit Of Omff, Cotswold Cider Company She Devil & Yellow Hammer & Seacider Mango Infused Cider. We partook in the Tuesday offer for ribs and wings along with a pint of one of their Big Smoke beers for £12. The brewery is indeed in a separate building at the rear, the other side of a secluded outdoor courtyard. 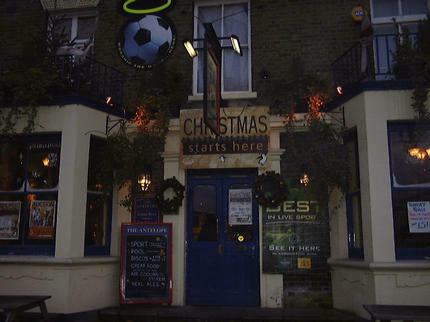 One of London's best pubs in my opinion. There was a funny smell but I think they had just painted the toilets. Was reasonably busy for a Thursday afternoon and not just your usual retired old men clientele. Would visit again if in area. A very well run Beer Festival this weekend,covers covering most of the courtyard,a decent selection of ales,quick service by polite staff. The beer was £4 a pint whatever the gravity and the pub has a bonus card,so many stamps and you get a free pint.I wish this pub with the Big Smoke Brewery were my local.9/10. The antidote to the Lamb nearby. Paid a return visit to the Antelope yesterday. It's a short 5 minute walk from the station. Yesterday there was a small market set up on the pavement outside, which I hadn't seen before. The ale and cider range still doesn't disappoint. Yesterday lunchtime it was Big Smoke (the resident brewery) Dark Wave Porter, Electric Eye Pale Ale & Underworld Vanilla Stout, Ascot Alley Cat Ale, Hardy & Hansons Rocking Rudolph, Vale Hornbrook & Brill Gold, Roosters YPA, Red Willow Mirthless & Belhaven Smoke Stack Stout. Ciders & perries can be found on handpull around the side of the bar - Gwatkin Squeal Pig Perry, Lilleys Mulled Cider, Hallets Heartbreaker & Millwhites Rioja Cask & Hedgelayer. We were here early enough to secure a table. But it can soon get busy. I think this was my third or fourth visit here and it's hasn't failed to disappoint as yet.